1. Bring 4 cups of water to a boil in a large saucepan. 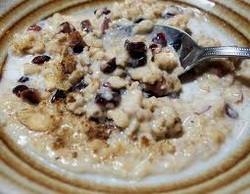 Add salt and oats and cook, stirring, until beginning to thicken, about 3 minutes. Reduce heat to medium low and simmer until almost all liquid is absorbed, about 30 minutes. 2. Add 1/2 cup milk along with honey, cinnamon and nutmeg. Cook, stirring constantly, until heated through and thick, about 5 minutes. 3. Divide porridge among shallow bowls and (if desired) pour warm milk over top. Sprinkle with dried fruits and nuts and diced apples, dividing evenly. You can also add fresh berries when in season. Serve immediately. Yum!